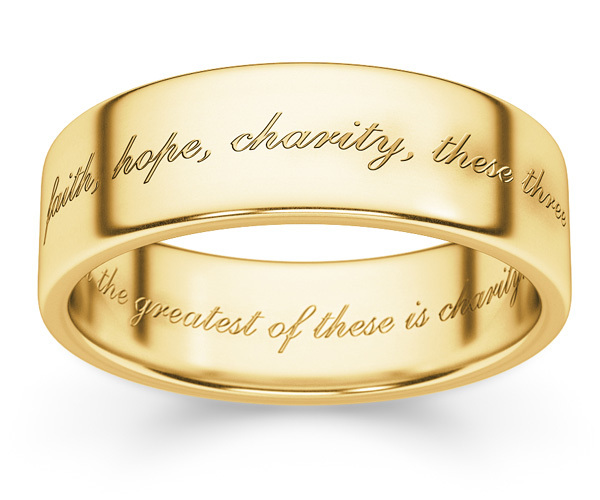 From one of the most famous Bible verses of all time, the words, "And now abideth faith, hope, charity, these three;" is engraved on the outside of the band and the verse is finished on the inside of the ring: "but the greatest of these is charity." (1 Corinthians 13:13). The band is made in 14k white gold an shown in a 6mm width (also available in 7mm or 8mm). The ring is available in men's or women's sizes and also available in white gold or sterling silver, shown below. Perfect as a Christian ring or wedding band. We guarantee our Faith, Hope, Charity Bible Verse Ring in 14K Gold to be high quality, authentic jewelry, as described above.